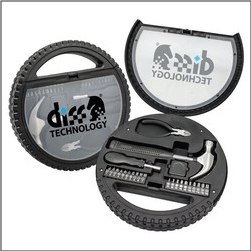 Place your order for great Custom Imprinted Tire Shaped Tool Kits complete with your company, business, or school logo. These great tool sets feature wire cutter, claw hammer, 20 various screwdriver bits, a multi-bit screwdriver, tape measure, and a convenient carrying case. These kits are great to upsell as a booster club fundraiser, raffle off, sell outright, giveaway as prizes, gift to your best customers, and more. Very popular with automotive shops and booster clubs.